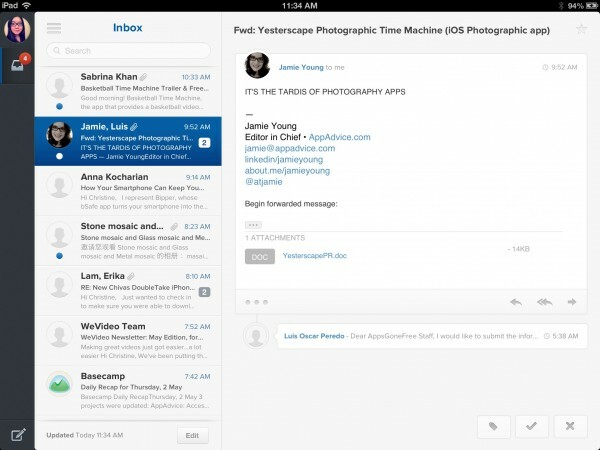 Evomail ($2.99) by Jonathan George is a slick new email client for your iPad. 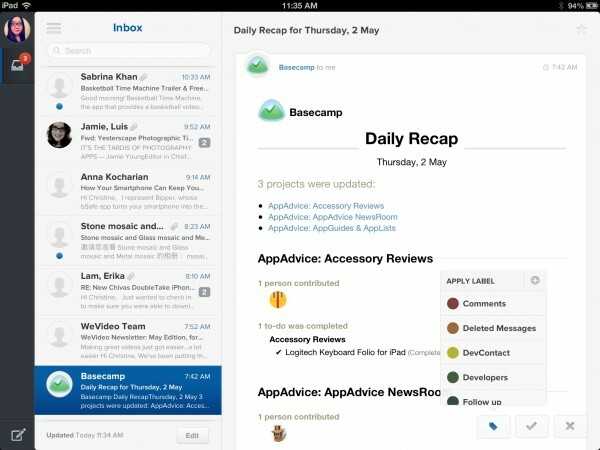 While there have been plenty of new email apps for the iPhone, such as Mailbox and Taskbox, there haven’t been too many for the iPad. 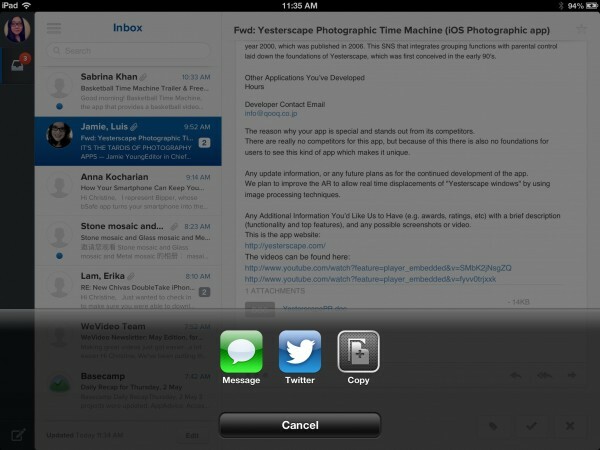 Of course, there have been a few, like Mailpilot and Incredimail, but most of the attention seems to be on iPhone. 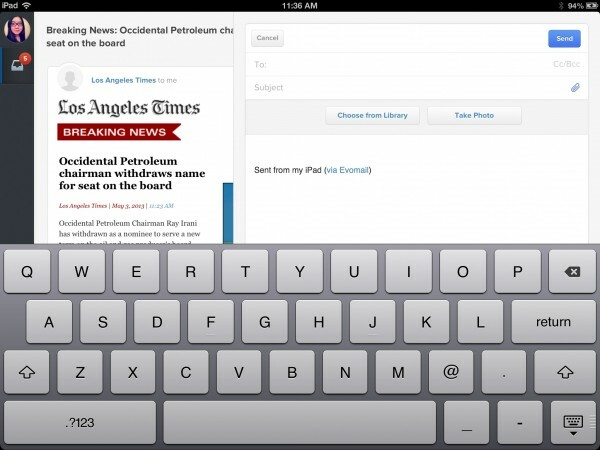 Fortunately, Evomail has arrived, and it’s quite a nice email solution for your iPad. We told you about Evomail earlier, but I got a chance to test the app out. 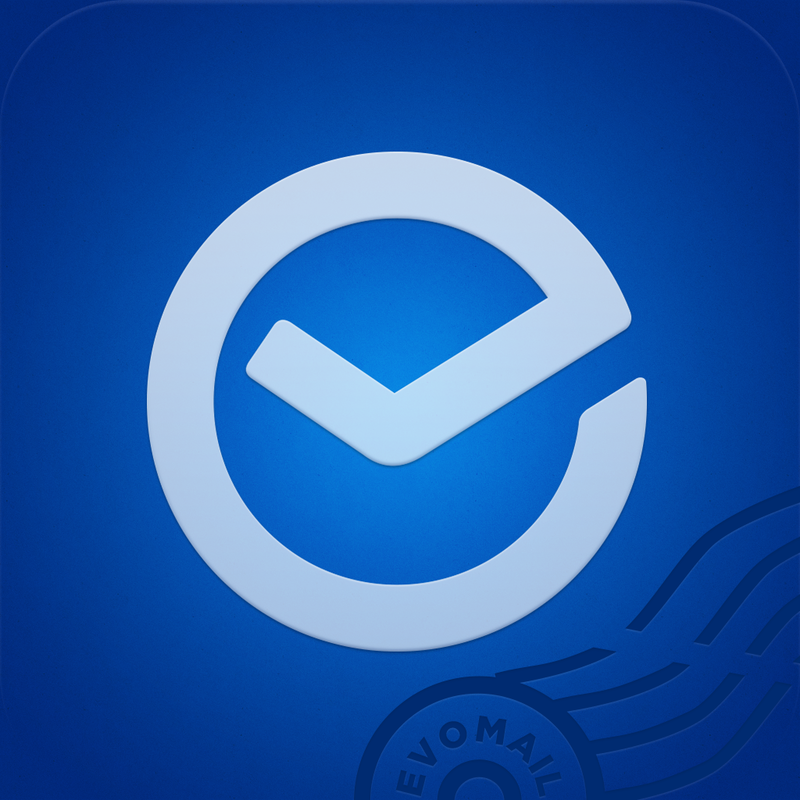 I’ve known about Evomail for quite some time now, and I’ve been eagerly awaiting its release. 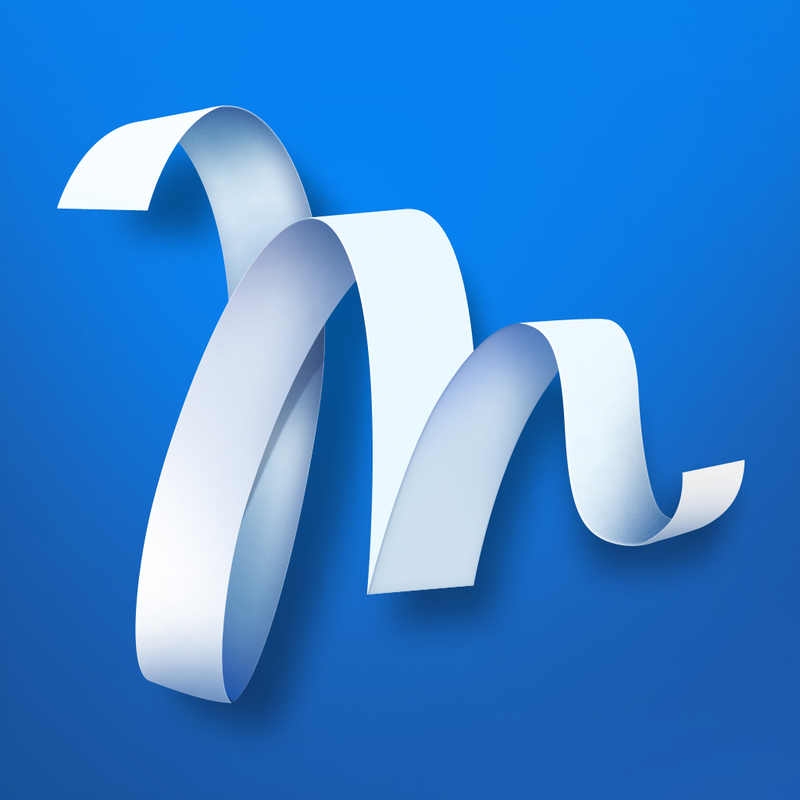 And now that it’s here, I’m really enjoying it, even though it doesn’t turn my inbox into a task list like Mailbox. 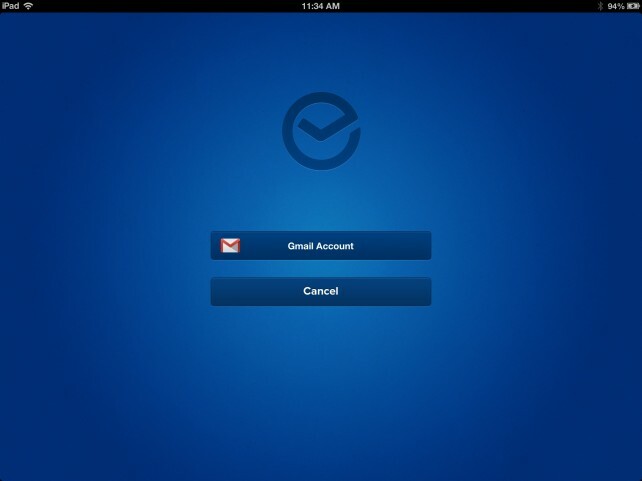 First and foremost, Evomail is only for the iPad, and it currently only works with Gmail accounts. So if you were looking forward to using this app with your Exchange or other IMAP email account, then you are out of luck. 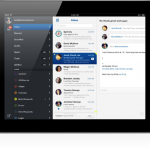 But keep in mind that the developers are working on adding support for more email services in the future. You can add as many Gmail or Google Apps emails as you want, as there is no limit. Evomail will not store any password data in the app, since it displays the Google login and permissions page. Setting up your email addresses is a bit slow, as you have to wait for the app to “prepare your inbox.” This takes a few moments and will probably depend on the size of your account. Once the app is done preparing, you can tap on the button to go straight to it. Evomail will display some helpful overlays on your first launch of the app, explaining the basic guidelines of using the app. I found the app to be pretty simple and straightforward — if you’ve used a handful of email apps, then you should know how things work. I love the interface of Evomail. It’s clean, minimal, and elegant, all while being simple to use. It kind of reminds me of Sparrow before Google took it over. 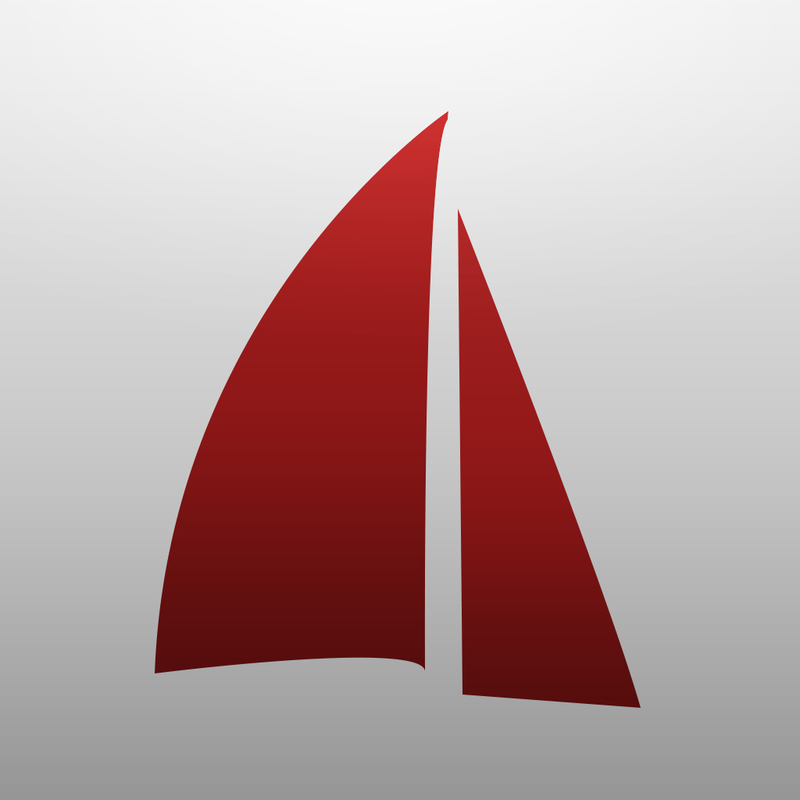 The app is split into three main columns: Accounts, Inbox, and Message view. You can switch between your accounts by tapping on the avatar in the top left corner. Underneath the avatar is an inbox button that will display a number badge, which represents the amount of unread messages that you have in the inbox. For quick access to the inbox at any time, just give that button a tap. 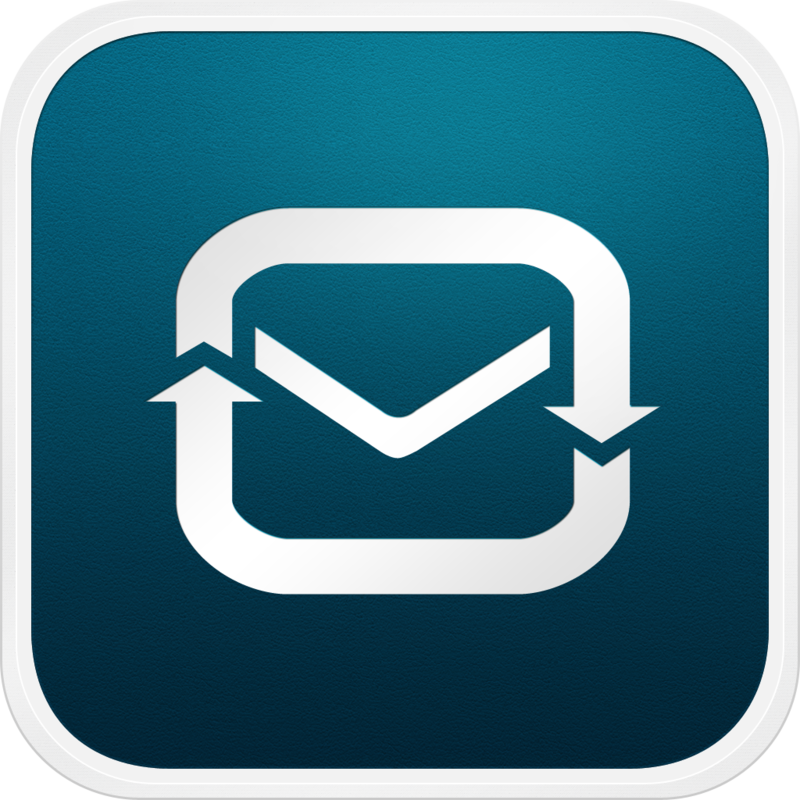 Unfortunately, Evomail does not have a unified inbox just yet, so you will need to navigate back and forth to view all of your messages. I hope that they will be adding unified inbox support in the future, as it just makes things a bit easier. When you’re viewing the Inbox, you have a search bar at the top. Just type in the keywords you’re looking for, and then hit “Search” on the keyboard. Results will pop up if the app finds what you’re looking for. An improvement can be made to the search by implementing filters for Subject, Message, and Sender, making things much more organized and easier. I would also like to see results in real-time as I type, as I get in Mailbox and others. I do like how messages are displayed in the Inbox list, though. You get avatars on the left, the sender, subject line, and an excerpt of the message (if available). The app seems pretty good about refreshing and getting new mail frequently, but you can also do it manually with a pull-to-refresh gesture. To read a message, just tap on it to bring it up in the third column, which also is the biggest, so there’s plenty of reading space. Evomail is pretty fast when it comes to loading up the entire message, so there’s little to no delay, depending on your data connection. If the email is part of a larger threaded conversation, all of the messages will load up at once. On the message view, you can quickly reply, reply all, or forward an email with the buttons in the bottom right of the message body. If you want to apply a label, you’re in luck! There’s full label support in Evomail, and you can apply as many labels as you want to a single message. 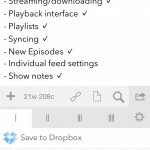 You can also quickly archive or delete with the other two buttons next to the labels. For an even quicker way of replying to a message, just drag the screen to the left. This will reveal a side panel, and you can either release after a quick pull to reply, or drag it even further to reply all. It’s definitely a convenient way to access the reply options without having to reach for the small buttons at the bottom of the message. When you compose a message, it’s the typical fare that you’d expect from an email app: add the recipient, Cc/Bcc, subject, and the body of the message. Adding images or video is much simpler than the native email app, as you can just tap on the paperclip to import media or capture new footage. One of the coolest features of Evomail, though, is the ability to share your emails with others thanks to the unique Sharing feature. This is accessed by tapping on the “…” button at the bottom left of a message body, and you get three options: Message, Twitter, or Copy. Sharing an email this way will provide a link on their servers so others can read it. This is best used for an email that you find funny, and want to share. I mean, you don’t want to share stuff that is meant to be for you only, after all. 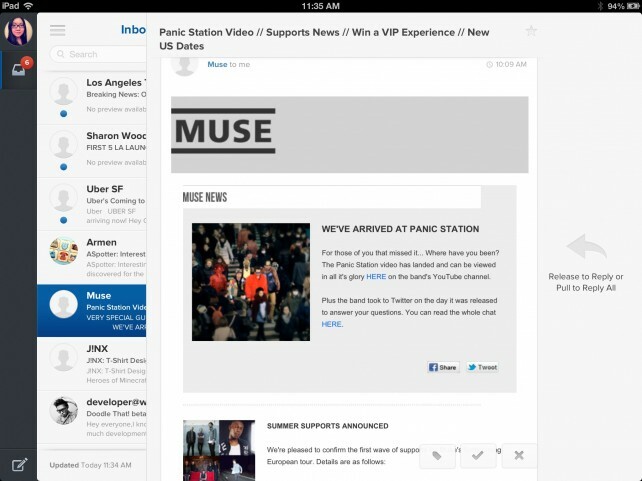 Now, what’s an email app without push notifications? Fortunately, if you need to know right away when an email comes in, you’ll be glad to know that Evomail supports push notifications right from the get-go. So far, I’m rather enjoying Evomail on my iPad. 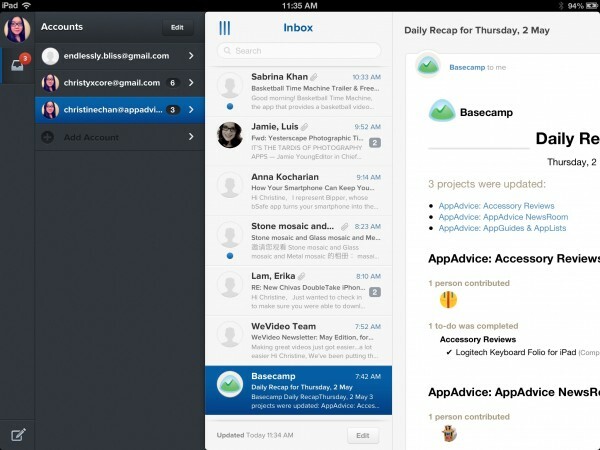 It’s a lot easier to manage my email with than with the native app, and I prefer the modern interface. However, it’s still not without flaws. As I mentioned previously, having a unified inbox would be nice, as it would eliminate a lot of going back and forth. Having filters on the search would simplify things, especially if there are a lot of potential results that are returned. I also prefer to see results returned to me in real-time, rather than after pressing the search button. It’s just much more convenient. I also found the initial setup of email accounts a bit slow — hopefully this process speeds up in the future. There needs to be a way to edit signatures too, as I there is currently no option for this (the default signature includes a somewhat obnoxious line of “via Evomail” that not everyone would like to use). And of course, the biggest flaw is the fact that it only supports Gmail and Google Apps accounts right now. I hope that the upcoming support for more services comes sooner rather than later, as the app will become much more useable for plenty of people once that happens. I still recommend giving Evomail a try on your iPad if you are looking for a chic new email app to use rather than the native one. It’s also great for Gmail users who rely on labels, because it’s all there. The shortcuts for replying is also nice to have as well, and sharing emails is a new feature that is actually pretty nice to have. 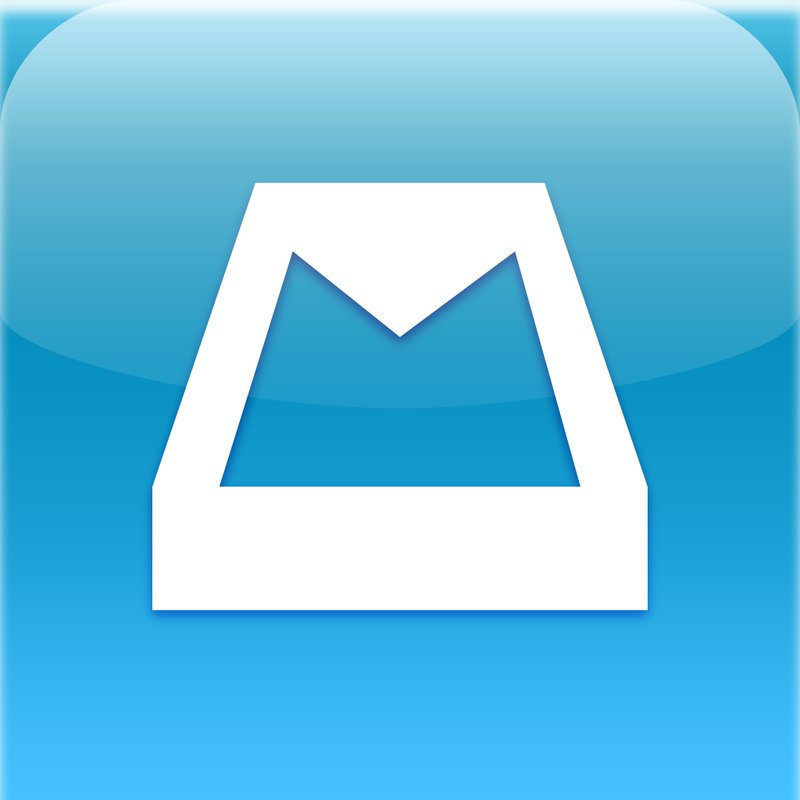 You can get Evomail in the App Store for your iPad for $2.99.